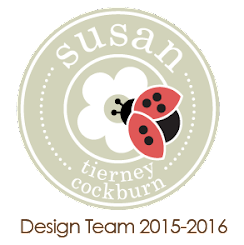 This is a collaboration project with Photo Play Paper and Xyron. Photo Play Paper sent the Xyron Design Team a complete collection from their newest releases. Of course I chose the Halloween (my favorite holiday) themed collection, Trick or Treat. 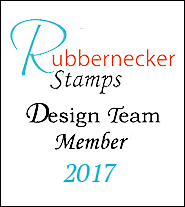 I received a pack of 12x12 inch papers, including a sticker sheet, an adorable... uh, I mean scary, photopolymer stamp set, matching dies, and a pack of cardstock die cuts. I love the different paper designs in this collection. I wanted to use as many as possible. Normally I would use up scraps for something like this, but in this case I had to cut them from full sheets, so now I will have some scraps to make even more cards like this! I used Distress Inks and a blending tool to ink the edges, giving them a polished look. By the way, if you like a simpler card, you could leave off some items, for example by keeping the background strips then highlighting one large item such as the tag, mounting on a purple mat to one side and just adding the banner. 1. Cut black cardstock 7x10 inches; fold in half to form a 5x7 inch card base. 2. 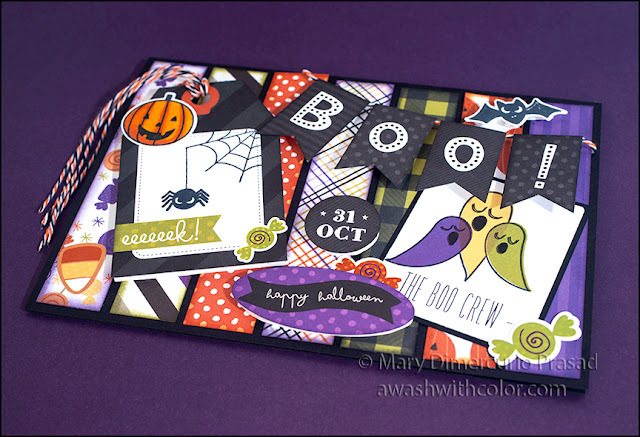 Cut strips 7/8 x 4 3/4 inches from the following papers (Trick or Treat): purple stripe, multicolor thin crossed stripe, green/black gingham, orange/white dot, candy, multicolor thick stripe, pumpkin. 3. Use the following Distress Inks plus an ink blending tool to apply ink around the outside edges of each piece you just cut: Dusty Concord - purple stripe, multicolor thin crossed stripe, candy; Rusty Hinge - pumpkin, orange/white dot; Peeled Paint - multicolor thick stripe; Black Soot: green/black gingham. 4. 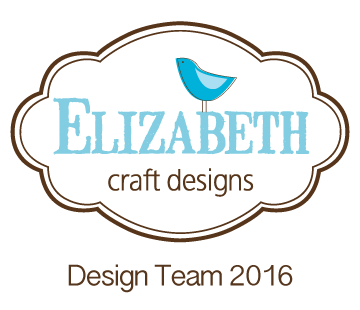 Use a Stamp Platform or Stamp Positioner and Memento Tuxedo Black ink to stamp the following. Stamp pumpkin and bat on alcohol ink friendly cardstock. Find "eeeeeek!" tag in Trick or Treat Cardstock Die Cuts pack; mask top and left of white stitched area with masking tape or Post-it tape. Stamp spider web as shown, pencil a line down from one of the web ends using a straight edge (see photo). Stamp spider on line where shown. Trace over line from web to spider with Black Copic Multiliner SP 0.3 (I prefer the SP versions to the plastic ones since they are refillable and the nibs are replaceable - less plastic going into landfills!). Erase any extra pencil. Ink edges of tag with Black Soot Distress Ink. 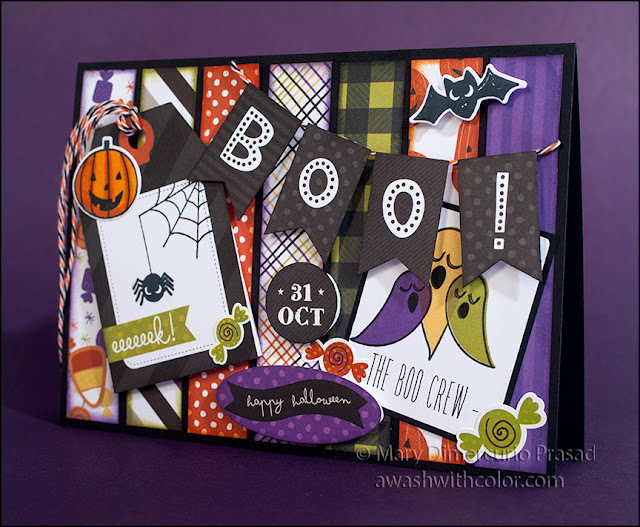 Find "The Boo Crew" in Trick or Treat Cardstock Die Cuts pack. Optional: stamp over ghosts using matching stamp (don't worry if it doesn't stamp perfectly; I think it looks a little more ghostly if it's slightly off like mine is). 5. Cut black cardstock slightly larger than "The Boo Crew" die cut (I just eyeballed it - used pencil tick marks where I wanted to cut) - about 1/16 inch all around. Color pumpkin with alcohol markers - I used Spectrum Noir Illustrator Markers colors BO2, BO3. Die cut pumpkin and bat. 6. 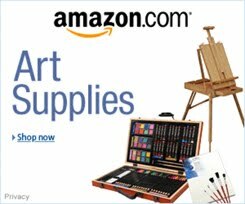 Find banner letters: B, O, O, ! 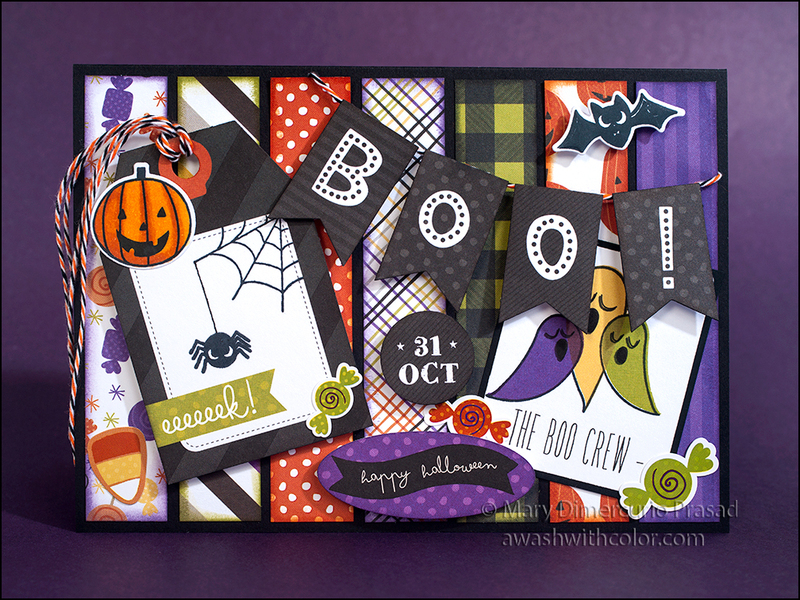 in Trick or Treat Cardstock Die Cuts pack. Ink edges with Black Soot Distress Ink. Use liquid glue to adhere to Halloween colored twine (leave extra twine at each end). From the same pack, find and ink edges of "happy halloween" oval and "31 OCT" circle. 7. On craft foam, trace around "eeeeeek!" tag and hole, bat, "happy halloween" oval, and "31 OCT" circle; you will cut on the inside of these guidelines later to add dimension to these elements. You could also trace the B, O, O, ! banners if you like but I just cut rectangles from the foam for behind these. Marking these will aid you in cutting around them after running through Xyron. 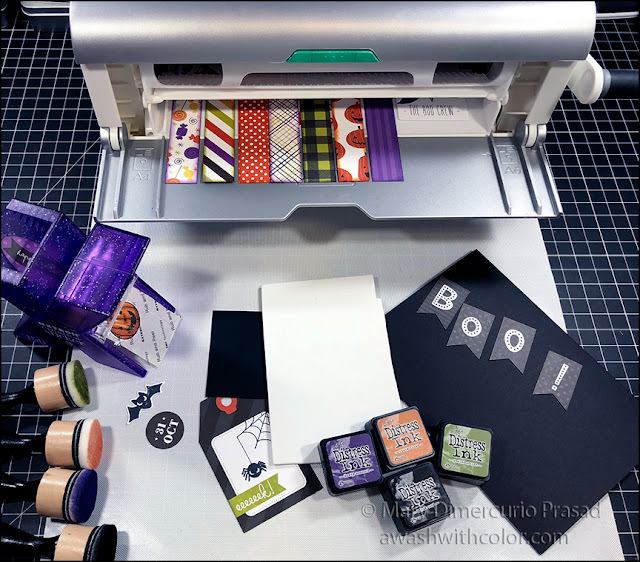 Run the following items through the Xyron 9" Creative Station with permanent adhesive: inked strips from step 3, "The Boo Crew" die cut, its black mat, "eeeeeek!" tag, and the piece of craft foam you marked up. Note: you could use repositionable adhesive in the Xyron to make it easier to place the strips. Run the following items through the 1.5 Inch Sticker Maker: pumpkin, bat, "happy halloween" oval, and "31 OCT" circle. 8. Adhere strips to card base as shown; to make it easier, lightly set down each strip so they may be further adjusted until they look good (they don't have to be spaced perfectly - just be sure to line up tops/bottoms and the two side strips as best as possible). Before pressing in place, place BOO! banner where indicated by pulling up orange/white dot top to tuck left end of banner twine under it, allowing for a little wiggle room; similarly lift up purple striped side to tuck right end under it, making sure to leave enough twine so the letters will still float even with dimensional foam under them. Press strips in place. Use Adhesive Eraser to gently remove any extra adhesive - it works like a charm! 9. To create dimension, cut marked craft foam on the inside of each mark - you want the foam to be smaller than its counterpart die cuts so it won't show when viewing the card from the front. Hint: if you want it to show even less, use black craft foam or go around the outside edges of foam with a black Sharpie or other black alcohol marker (Copic Ciao, Copic Sketch). Leaving foam on release sheets, adhere die cuts to their matching foam such that the sticky side of the die cut will be against the non-sticky side of the foam (the sticky side of foam will be used to adhere it to the card). In the case of the tag foam, before adhering cut off the hole area making a U shape from the top so you can tie twine around the tag once they are stuck together (step 10). In the case of the BOO! 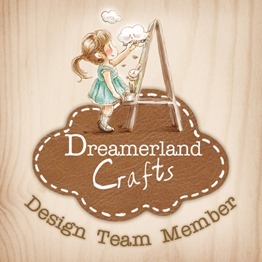 banner die cuts, just cut rectangles from the foam and adhere the sticky side to each letter - this is opposite of the other die cuts so the letters will be able to move around a bit on the card (don't put any foam under the part of the B banner that overlaps the tag). 10. Add twine to the tag by cutting two pieces, fold in half, loop the fold through the tag hole from the back, then fed the ends through the loop. Adhere all die cut pieces where shown. Add candy stickers where shown. Follow my blog with Bloglovin so you won't miss any of the Halloween in July fun!